The new SS18 Collection has arrived! 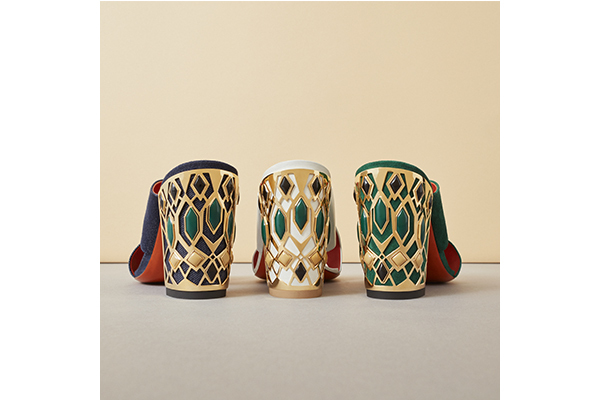 Mules and sandals with essential lines enriched with bold colors and sumptuous details. Discover it online. A ritzy tonal heel adorned with intricate metallic detailing for this white-leather peep-toe sandal with two wide straps crossing over the foot arch. An opulent adornment which imbues this fuss-free pristine piece of footwear with a powerful personality. It includes a leather sole. A combination of the soft suede and the regal hue of green makes for an extremely elegant peep-toe sandal with two wide straps crossing over the foot arch. Resplendent in the simplicity of its design, it features a chunky heel covered in suede and decorated with intricate metal detailing. It has been peerlessly finished with a comfortable leather sole. The new Collection comes from the pursuit of perfection and offers a perfect combination of attention to details and unique workmanship. A refined black & white colourway for this leather peep-toe sandal embellished with a double buckle detail. It has been elevated with a maxi fringe, imbuing it with originality and sophistication. An extremely comfortable piece of footwear with a leather sole, chunky heel covered in leather and back strap. Originality, sophistication and chic overtones for this peep-toe sandal crafted from pink suede with a matching heel and leather sole. A boldly seductive design with a maxi fringe and double buckle detail, making a powerful style statement.